Place names are one of the main sources of our knowledge of the history of language, but they also contain important information on the culture of earlier periods and social conditions, not necessarily produced from other historical source material. In this way place names are an important source of knowledge about early settlement history. An analysis and interpretation of place names in Jelling and the surrounding area was published in the series Denmark’s Place Names (Volume 8, Vejle County Council) in 1944. However, this publication is somewhat out of date. Therefore this sub-project, which started in 2009, takes as its starting point a linguistic analysis and critical examination of the existing interpretations. Answers will be sought to the following questions: What do the place names mean and when were they created? In which ways do the place names of the Jelling area tell us about the settlement’s development and history? What do the area’s place names tell us about society and landscape in other respects and to what extent can disappeared/abandoned settlements be identified and located? The project’s results will be mapped and integrated into the Jelling Project’s GIS, so that the settlement historical summaries and place name interpretations can be directly compared with the research results of other disciplines. In this way the basis can be created for an interdisciplinary approach to the cultural historical landscape around Jelling in the Viking Age and early medieval period. Project coordinator: Assistant Professor Rikke Steenholt Olesen, Name Research Section, Department of Scandinavian Research, University of Copenhagen. Place names are not just a source of information about early settlement in general. The Jelling monuments dominate the modern landscape and there is hardly any doubt that they were intended to be seen. This project places particular focus upon place names as statements of communication and defence. Can place names give an impression of how, and by which routes, people moved through the landscape around Jelling? In addition, has the royal interest in the place as early as the Viking Age left traces in the form of structures or administrative locations, which disappeared long ago but still can be traced in the place names of Jelling and its surrounding area? The project begins in the spring of 2010. Together with the other archaeological, cultural historical and natural science investigations in and around Jelling, it will contribute to painting a picture of the environment and the landscape that the Jelling monuments were a part of. The Danish ‘Husby’ place names are the subject of particular debate. In Norway and Sweden ‘Husbys’ are attributed with a special significance connected to the establishment of political-administrative structures in the late Viking Age and early medieval period. The question is whether this also applies to Denmark. Therefore in the long term the project aims to shed light upon the Danish Husby names’ significance as statements, together with the conditions which led to their emergence, not least with reference to Husby in the parish of Grejs and its relevance to Jelling in the age of the monument. Project coordinator: PhD Student Lisbeth Eilersgaard Christensen, Name Research Section, Department of Scandinavian Research, University of Copenhagen. 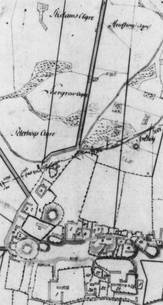 The earliest land registry map of 1781, copy from 1811. The National Survey and Cadastre. The Royal Danish Academy of Sciences and Letters’ map of 1787. The National Survey and Cadastre.